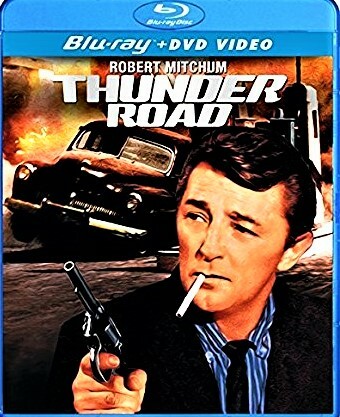 Starting with the name, "Thunder Road" takes on mythic proportions as it flows from the 1958 Robert Mitchum movie through the 1975 Bruce Springsteen song and beyond. There's even another movie with the same title out in 2018. During the US-Vietnam War, Thunder Road was the dub name for South Vietnam's National Route 13. 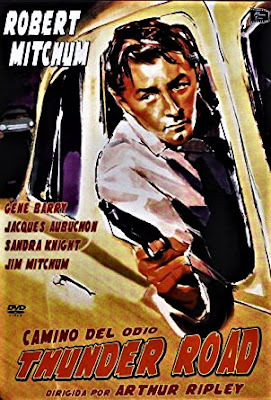 The movie Thunder Road was really Robert Mitchum's labor of love. Arthur Ripley was given the director's credits. but Mitchum was the main man for this project. Much of it was filmed in and around Asheville, North Carolina, standing in for Harlan County, Kentucky, and Memphis, Tennessee. Thunder Road is a bit different from what one might expect. It's largely sympathetic to moonshine runners in a largely dry American South, but also shows that change is inevitable. Gangsters are trying to take over the routes, lawmen seek to disrupt the system, generational differences are starting to emerge. Lucas (the Robert Mitchum character) is a veteran of the Korean War and a very tough dude, indeed. He has a spacial lady friend in Memphis and an admirer in a girl next door in the Appalachians. 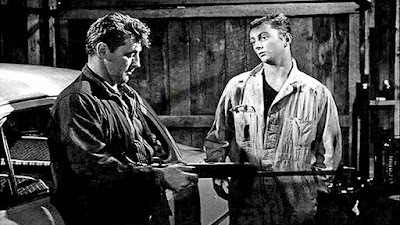 His younger brother Robin (played by Robert Mitchum's son James) services his smuggling cars but also wants to be a driver -- something Lucas wants to deter at all costs. The Korean War did something to him, too -- made him world weary.